Virgo is a calm and balanced sign. Raising the children of this constellation is much easier than restless and fussy kids of air and fire signs. But here there are some nuances. Virgo from childhood to niggle, and especially fastidious to eat. They flatly refuse to eat what they did not like once. These kids love cleanliness and comfort. If the mother did not change the diaper on time, they begin to cry and demand proper care. Do not like them and dirty bibs or clothes. Growing up, Virgo becomes even more picky and demanding. It is difficult for her to get acquainted with new people, but if she is used to something or someone — it’s forever. Virgo children painfully suffer any changes in life. They want stability, they do not want to part with their favorite things. Already adult representatives of this sign are very sensitive to a toy or object that reminds them of a cloudless childhood and home. This baby loves the order as much as that she will not wait for Mom to get out of her room. She removes it in her locker, folds the toys, and if she sees a small spot somewhere on the clothes, she wants to wipe it off as soon as possible. Virgo loves to help her mother around the house, but she cares for her parents’ care. Do not expect her special thanks. All feelings of the Virgo are instinctive, she loves parents, but without unnecessary emotions. The best friend of such a girl is a diary. If she is ready to pour out her experiences in full, then only on paper. Sneakiness and dryness makes her a hermit. She often has no luck with her friends, she does not like noisy companies and fun activities. Virgo would rather go to the library and read a book than spend time on empty entertainment. The boy of this sign is also difficult to make friends. Often he has only one, but a reliable and trusted friend with whom he ate not one kilo of salt. Due to indecisiveness and closure, the boy may develop an inferiority complex. Therefore, parents need to make every effort to develop in the son of confidence and firmness. Virgo boys love games for the mind, they will gladly solve puzzles and crossword puzzles, master chess and solve puzzles. Virgo does not attract fights and disassembly. They are often manipulated by children of stronger signs, and the Virgos do not have the strength to resist them. Because of this, they can feel second-rate and weak. It is important to explain to the child that not always strength and pressure makes a person better and more worthy. More often it is adorned with mind and restraint than impulsive displays of feelings. The Virgo children are self-sufficient and do not need anyone’s praise. In high school, they already clearly represent where they want to study and work. Virgo absolutely does not accept criticism, but he adores others with criticism. Sometimes it requires too much from relatives and friends. Excessive seriousness and severity prevent her from enjoying childhood. Virgo does not commit stupid thoughtless deeds. She plans everything, carefully weighs all the pros and cons. Her punctuality can envy many adults. Virgo is always neat and taut, she cares about both external and internal purity. These children are difficult to knock on, they do not let anyone in the soul. Virgo is very compassionate, loves animals, pities the sick and the elderly. However, she does not know how to express emotions violently, so it may seem stale and indifferent. Many Virgo people have a sense of purpose, but they like to act according to a pre-scripted scenario, and if something goes wrong, it dislocates them. Children of this sign can be trusted with money. If mom gave pocket expenses, Virgo would spend it on school meals or something useful, not chewing gum or other nonsense. Such a child is surprised by his discipline and calm. But no one knows what is happening in his head. Virgo is mean to emotion, she says with restraint and quiet, and before she says anything, she thinks it over well. To foreign people such a child may seem like a treasure, an angel in the flesh, but parents know how difficult it is to talk a Virgo-child and find out what really bothers him. Vulnerabilities of all Virgos are the stomach and intestines. Children of this sign often suffer from poisoning, despite the fact that they are the most clean. 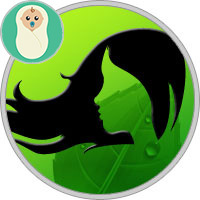 You need to be very careful when choosing a meal for the baby-Virgo. The fact that another body would digest easily, the stomach of the Virgo can simply not accept. In addition, representatives of this sign are prone to nervous disorders, because they are very hypochondriac and hold everything in themselves. Virgo has a penchant for lung diseases, but her main problem is the gastrointestinal tract. Do not force the baby to eat much, do not worry that he is too skinny. Virgos are slim by nature, they eat exactly as much as they need. They intuitively feel which products are suitable for them and how often to use them. Virgo from a young age, she takes care of her health. If such a child does something, then surely he will finish what he started. He is very self-critical and sees all his mistakes and shortcomings. Do not criticize the Virgo for her shortcomings, she herself knows them well. Instead of helping the child, you can completely discourage him. The Virgo needs maximum concentration. If someone invades her personal space and makes recommendations, she can get angry and throw things to spite. Girls of this sign are fond of needlework and drawing, and boys — reading books, carving wood, sometimes music. With Dev come out highly qualified professionals in science, history, mathematics, philology. These are future employees of libraries, archives, research laboratories. Virgos are bad bosses, but they are wonderful performers. They work slowly but diligently. Never drive a Virgo, if you want her work to bring good results. Virgo is the most exemplary student in school. She has little fun and walks, she spends most of her free time reading books. Classmates call her "a lesson", but teachers praise and trust her important assignments. The class teacher appoints the Headman and his right hand. Usually such schoolchildren do not know how to cheat and write off. Homework they do in good faith, and if for some reason they did not comply, they are terribly worried. Virgo early determined with the profession, clearly draws her own way of life. It rarely goes beyond the boundaries of the social system. In the study and career of the Virgo there are no sharp leaps or falls. For it is important stability, because violate the generally accepted canons, means to leave the comfort zone and, perhaps, "mess it up" with something its spiritual integrity. It is quite easy to educate a good and honest person from it. However, it is necessary to teach the Virgo to relax, to look at the world more simply. Simple life joys are more important than rigor and order. Let your child sometimes break the rules and not be afraid of condemnation. Try to get Virgo out of the public gear, show her the other side of life, the one where you can afford to be free and real. Drive your child on an active holiday, go to travel with all the family. Show him the world and new people, and then the Virgo will understand that he is much wider than her closed and inviolable outlook. If you make a note to a child, give it as a friendly advice. Do not raise the voice of the Virgo. She does not tolerate any violence against herself. By nature, Virgo has a slightly narrow mind, so it tries to expand it on its own. The duty of parents is to help her in every way. Buy your child interesting books and educational games. Older children will benefit from encyclopedias, maps, additional textbooks. From the first years of life, add the Virgo to the children’s collective, teach them to find a common language with the children, not to inform the educator about them. Often, friendship and communication are much more expensive than principles and correctness. The child must understand this and the earlier, the better. Growing up, Virgo can move away from parents, if they feel their misunderstanding. It is necessary to restore the trust of a teenager in time, so that it does not close completely. Talk with Virgo calmly, without reproach and condemnation. She already suffers from self-criticism. Convince the child that he told you everything that excites him and interests him.